China's booming economy lifted the standard of living for millions. 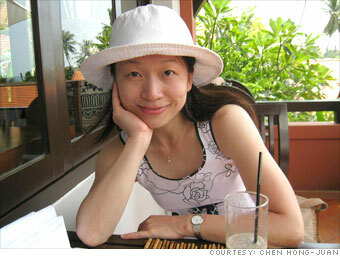 Meet nine Chinese people who are now part of the middle class. The past 12 years marked one of the best stages of my life. In the beginning of 2000, my income at a large state-owned enterprise reached $31,750 a year, and I started to consider buying a car and a home. Three years later, I got my first car, a China-made Buick. Now, I also have my own apartment, an 860-square-foot unit located in downtown. I made a one-time payment of $66,600. I started investing in stocks and equity funds in 2006, and received huge gains from the bull market two years later that laid a good foundation for my future. As making money was no longer my goal, I started focusing on other parts of my life. I finished a three-year MBA in 2004, and fell in love with traveling. In the last four years, I have visited at least 1 or 2 countries each. "50 countries before my 50s" has become my lifetime dream. In 2007, I left a job that I didn't really enjoy. Now, I'm working for myself, aiming to become a mental health counselor. Without China's rapid economic development, I could have never imagined owning a car or an apartment, let alone living a great life simply on my own investments. I'm still single at the age of 37. In China I'm called the "leftover lady" or "3S woman" - but I have a belief that my life is always going to get better.